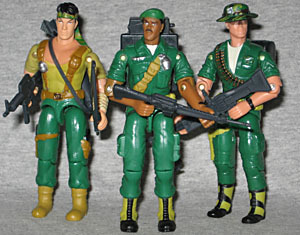 Some of Hasbro's GI Joe comic packs gave us new characters, while others gave us slight updates of old favorites. But there's at least one that gave us some highly popular characters in a way never seen before. Before evil corrupted him and changed his fate forever, Storm Shadow shared a close friendship with Sgt. Stalker and Snake-Eyes, serving with them in the same military unit. Back then, he was known to everyone as "Tommy" and always carried his bow and steel-tipped arrows as well as his M16 rifle. During one long-range patrol, the three friends spotted an enemy fighter and, knowing the rest of the fighter's platoon couldn't be too far behind, they radioed for evacuation. Just as the helicopter arrived, weapons fire tore through the air, seriously wounding Snake-Eyes. Ignoring orders to leave his friend behind, Storm Shadow ran through the crossfire to rescue him, dodging bullets with uncanny ease and saving Snake-Eyes from certain death. Yes, this is the "pre-Storm Shadow" Storm Shadow, and it's also the only Storm Shadow figure ever released not wearing any kind of ninja gear. I suppose you could count his headband and his forearm wraps, but any sort of soldiers could wear those. The important thing is that he's not wearing white pajamas. The body construction is strange, with a huge chest (re-used from the original Roadblock) and a comically oversized head. Of course, the old figures all had huge melons like this: it's only in recent years that we've gotten decent proportions. Tommy's accessories aren't the best, either. He has a green vest that makes his already-huge chest look even bigger, an M-16 he can't hold very well due to the soft sculpt on his 1984 hands, a bow, and the same crummy quiver and arrows we saw with the Comic Pack 74 Zartan. On the plus side, if you strip off the vest, you can actually get the quiver on him without it snapping, which already moves it up one notch from the previous release. Sgt. Stalker knows more about Snake-Eyes and Storm Shadow than most people. He fought beside them when they served together as part of a long-range recon patrol, back when he was named "Lonzo," Storm Shadow was called "Tommy," and Snake-Eyes was known as [CLASSIFIED]. Sgt. Stalker carried his suppressed M16 with a sure and steady grip, taking point as they scouted out hostile territory. One day he found out how deep loyalty between friends can run. They encountered an enemy soldier in advance of his platoon, and before they could be evacuated, weapons fire exploded around them, wounding Snake-Eyes so seriously that Sgt. Stalker thought he was dead. The evac chopper was being fired upon, so Sgt. Stalker ordered Storm Shadow to leave Snake-Eyes behind. But Storm Shadow disobeyed orders and ran through a hail of bullets to rescue his friend. Stalker is a classic Joe, but he's definitely not the reason anybody was buying this set. 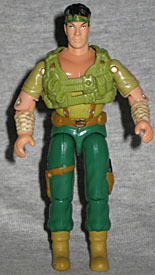 The figure is built from pieces of many different Joes, but surprisingly, none of them is the original Stalker. His head is a decent size, sine it came from a figure introduced in 2004 - in another comic pack, incidentally. He's wearing his trademark green beret, and is sporting a mustache and a steely eyed stare. He looks young, but that suits a story taking place in Vietnam. Lonzo only has two accessories, but neither is terrible. He's got an M-16 (which is an entirely different size and construction than Tommy's) and a black technological backpack. It's not the mot exciting sculpt, but he was carting around the team's radio equipment in the story, so that works for him. The backpack is re-used from the SAW Viper, which means it first showed up in 1990 - making it a bit too technological for a story set in 1975 at the latest. Snake-Eyes owes his life to Storm Shadow, which makes it even more of a tragedy that they are now bitter enemies. Back when he was a regular soldier in the military, Snake-Eyes served with Storm Shadow and Sgt. Stalker, long before the GI Joe Team and the Cobra organization came into their lives. 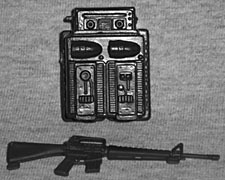 While conducting long-range recon, Snake-Eyes carried two things with him at all times: his M60 machine gun and a battered picture of his twin sister. He never spoke much, remaining silent even when Storm Shadow offered him a place in the "family business." On one patrol, Snake-Eyes was seriously wounded in an attack, and Storm Shadow risked his own life to run back through heavy weapons fire to save him. Now, every time Snake-Eyes faces his enemy in combat, he cannot forget that this is the same person who once was his friend. Now this is the figure that undoubtedly sold the set. Everybody loves Snake-Eyes, the Joe team's man of mystery. So the chance to get an unmasked, pre-ninja version of him? That's awesome. It would be like getting Wolverine's origin in action figure form. The comic never actually showed his face, though, so how would the toy duplicate that? Very well, that's how. He has his hat titled forward, and just in case you decide to peek under there, they've actually painted a shadow over his eyes. Brilliant! His head is re-used from a comic pack Hawk, but it works well here. Snake-Eyes (his name is redacted on all the filecards, but you can make out that it starts with an "N") has a black backpack and a nifty M-60 heavy machine gun with a separate bipod. Those are nice, but his best accessory isn't even removable. 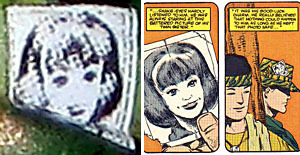 Tucked into the band of his hat is a small picture - the photo of his twin sister that he always carried with him. It's microprinted, so you can see clear detail even at this small size. It's a little touch like this that makes a figure great: it shows that the people making the toys care. All three figures are painted well, with a bright vibrant green that's shared between all their uniforms. It's not quite olive drab, but it does the job of making them look like generic soldiers fairly well. The camouflage paint on Tommy's headband and N.'s hat are applied well (though the golden hat band was painted on crooked). This is a story set in Vietnam, and all three figures do a nice job of looking like era-appropriate soldiers. 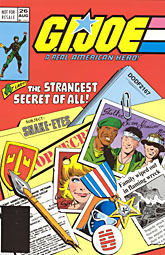 This set includes a reprint of GI Joe #26, a landmark issue. It's the origin of Snake-Eyes, after all! But there's more than that to the story, as we also learn Storm Shadow's real name, are introduced to the Arashikage ninjas for the first time and learn about the two former friends' shared history. Plus there's a whole 'nother plotline going on Joes and Cobras hunting each other near Zartan's shack. The art is very good, too. It would be worth buying this set just to get the comic, let alone the three figures! Tommy and Name Redacted are the stars of this set, but that doesn't mean Lonzo is worthless - just a bit boring by comparison. This set will give you a Snake-Eyes and a Storm Shadow wholly unlike any others you have, and after 20-some-odd releases apiece, that's no small feat!